One of the great things about cycling is that it can be a social sport. We often see groups of cyclists out on a Sunday morning, friends riding together and even couples making a sporty date of it. There’s so many benefits of riding a bike with friends that there’s little reason not to jump on a tandem. However, tandem riding is not as easy as jumping on a tandem bike and effortlessly pedalling away. It takes practice and synchronization and….compatability! Following their third win at the prestigious Duo Normand, we turn to Tri Energy tandem stars Chris and Phil to see the winning ingredients for becoming a successful tandem pairing. By Captain we mean the one who’s piloting the bike. Typically this would be the lighter of the 2 riders with the heavier rider on the back but Chris and Phil ride the tandem with the heaviest athlete (Chris) on the front. This is because Chris has raced on, and piloted, a tandem before – so bear in mind each other’s experience when choosing. Once you’ve found a partner, you need to find a tandem! Chris and Phil bought their tandem off eBay which used to belong to an ex-para cyclist and was a great bargain for Chris & Phil back in 2011. They have added to it over the years with new wheels and bars for a more aerodynamic position. 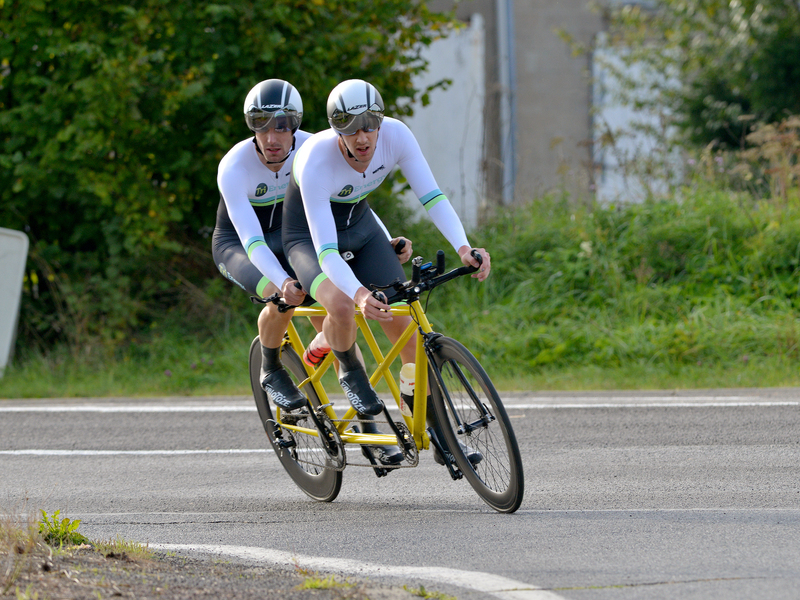 When we asked Chris & Phil how often then train on the tandem, they said…..never! SO maybe practicing on it is over-rated? The difficulty with going out on the tandem is the pairing can’t just go out on any route. The gearing makes climbing very steep hills difficult as it’s set up purely for racing in a time trial position it can prove rather uncomfortable for normal riding! They do however keep fit with their own cycling and turbo training and – when the mojo is there – go out cycling together. What is the Duo Normand? 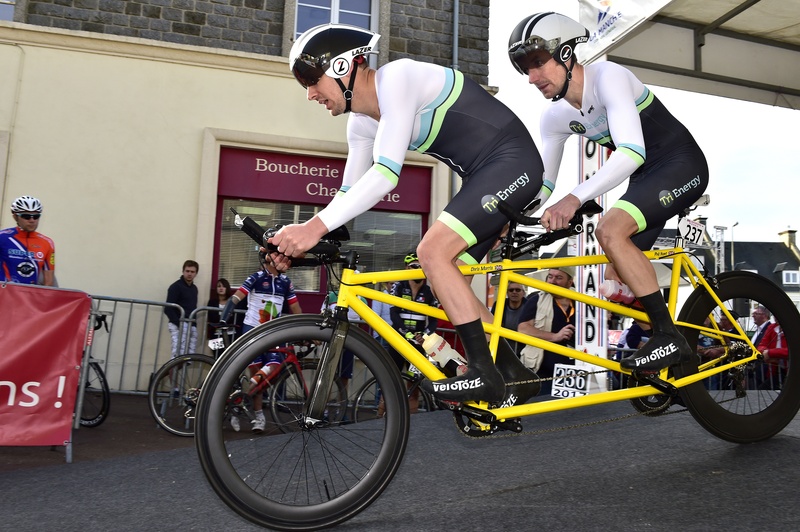 The Duo Normand is an annual race for 2-up partner teams and tandems in Normandy, in Northern France. This year was the 36th holding of the event. For Chris it was the 16th time he’s done it; the 5th time on the tandem, having done it previous times as a 2 up. This was the third win for Chris and Phil having won in 2012, 2016 and 2017! It attracts people from all over (many countries) and is absolutely awesome. Every team gets their own following car apart from the out and back section into the town to finish. What races are available to people doing tandem cycling? It is possible to do some time trials in the UK but not all time trials are open to tandems so you need to double check first. One of our favourite events is the Tandem Triathlon where one person swims, you both bike on the tandem, and the other person runs. Enjoy the process of doing something new!